 This first volume of a planned two-volume collection could almost serve as a primer on old-fashioned Italian short fiction. Ortese (The Iguana, 1987) drifts from one dreamlike subject to the next in these cerebral and enjoyable stories, most related in the same educated, uninvolved first-person voice. The narrator of ``The Submerged Continent'' describes a wealthy family from Naples with three daughters who may or may not be real. ``Torture'' has no characters per se, but it's a startlingly clinical examination of romantic love and the havoc that it wreaks. In ``Donat'' the narrator sits in a dingy room at six o'clock and dreams of seeing a man named Donat in a bar at six o'clock, only to have Donat say that he too has dreamed of seeing the narrator in the bar at six o'clock some time in the future. ``The Ombras'' takes its name from a family--whose surname means ``shadow''--whom the narrator visits, only to glimpse them gathered around the bed of a young girl with a black and swollen body. In ``The Tenant'' the narrator's grandmother shares her room with an angel named Mr. Lin, who eventually grows wings and leaves. ``Moonlight on the Wall'' follows a pregnant woman who is suddenly finding joy in ``the mysterious beauty of being alive,'' even though she is convinced that few people appreciate her. ``The House in the Woods'' is the lengthiest and least successful of these stories. 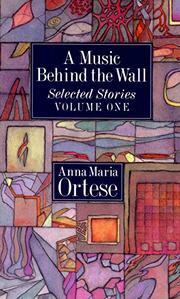 Its narrator lives with Trude, whom she describes as ``the bruised and swollen side of one's own soul,'' and there is an odd incident with two men who are either plumbers or thieves or something else altogether, but Ortese has played the same tricks in a smaller space in the earlier pieces, so this time around they seem elaborately elongated. Interesting, but with a strangeness that sometimes becomes predictable.